Dispute about Margaret Cussen's will, Irish Times, 13 June 1903, p.5. Supposed to be Cussen graves at Knockpatrick, Co.Limerick, but cannot see them. others gave evidence of eccentricity, but the jury decided that she was of sound mind. 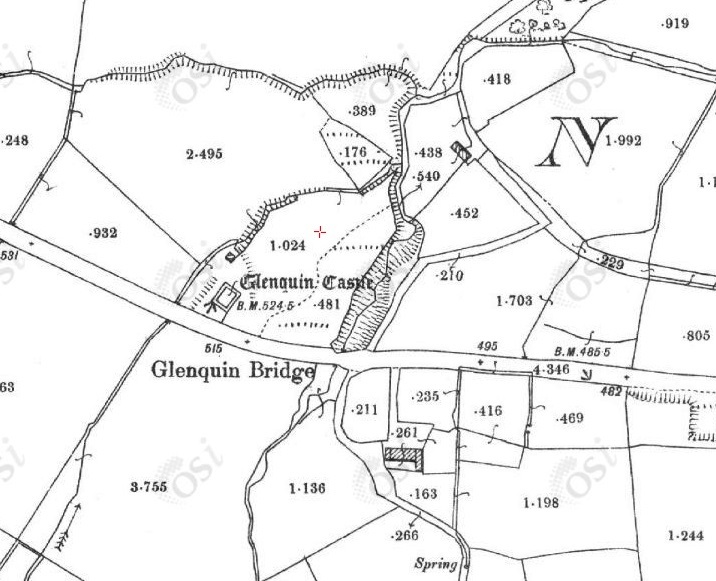 Glenquin Castle on 1887 to 1913 map. 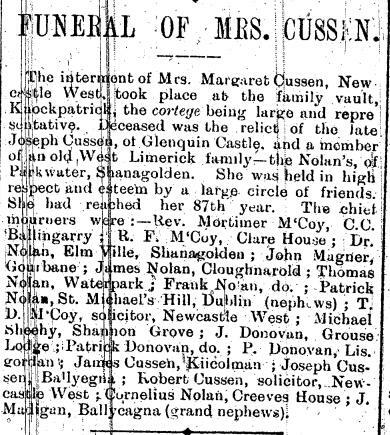 Funeral list of Margaret Nolan, 1903, shows many relationships in the Nolan and Donovan families. John Cussen (below) married Kate Donovan, niece of Margaret Nolan (above). John and Kate's sons, Robert Cussen, solicitor, and his brothers are described as "grand nephews" of Margaret Nolan (above) at her death in 1903, which they were through Nolan. Whether the Cussens above and below are connected is not known. 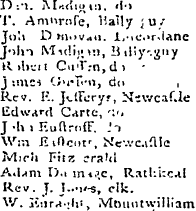 "James Cussen" and "Robert Cussen" are listed at Ballyegny in [Tithe Survey, 1823-37]. and later of Kilcolman House, Co.Limerick. 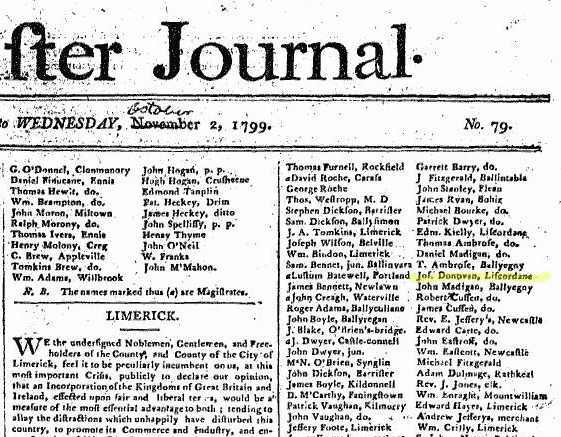 "Robert Cussen, Ballyegny" and "James Cussen, Ballyegny" signed a 1799 petition in favour of the proposed Act of Union. (Left) Petition in Finns Leinster Journal, 28 Sept to 2 Oct, 1799. (Right) Petition in Belfast Newsletter, 1 Oct 1799.